Talkroute has a business phone service capable of turning your Smartphone into a professional business line. Entrepreneurs and small business owners can select a local number of choice, a toll-free number, and more. Connecting your Smartphone with Talkroutes App is easy and cost-effective! Read on to learn how Talkroute may fit your business phone service needs. Talkroute offers a high quality call forwarding service, available through calling a specific number, or mobile applications for outgoing and incoming calls. Out of competitors such as Grasshopper and eVoice, Talkroute stands out with the best rated support team, and the cheapest starter plan that also includes unlimited minutes and limited text messaging at no additional charge, unless this limit is passed. Who is Talkroute right for? Talkroute is a tool best suited for an entrepreneur or small team who may need a little extra help in getting set up in a new phone system, and may grow over time to require additional support delivered through a service level agreement, or a similar, HIPPA-compliant BAA. With a baseline price of $19 for a soft phone system without some auto-attendant features, Talkroute Basic is great for entrepreneurs who just need a phone number and some simple features to get started. Talkroute does not try to sneak in hidden fees, or unexpected add-ons to their service. Talkroute only offers a 7-day free trial, which is one of the shortest of the competing services we’ve reviewed, so be sure to have a plan in mind to test the system when signing up. Grasshopper is good for new entrepreneurs or small teams that need a reliable, simple solution for their calling, and who intend to fully use systems like unlimited texting or other such, a la carte features. 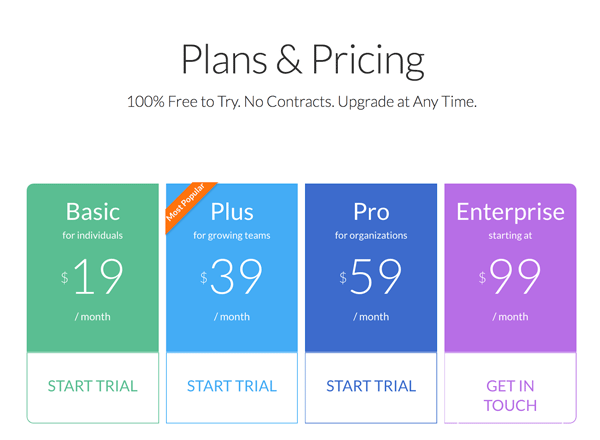 Talkroute offers multiple pricing tiers. The most basic tier is the Basic Plan, an entry-level plan with one phone number and voicemail box.. The top tier is the Enterprise plan, which offers unlimited extensions and tools for teams that need to track their phone call activity. Take a look below for the calling features that come with Talkroute, and how each package adds more advanced features. Who should purchase the Basic plan? Talkroute’s Basic plan is perfect for an individual business owner or new entrepreneur looking to establish just a phone number with simple, online features like voicemail, customizable greetings and the ability to use Talkroute’s mobile app, or call forwarding to make calls with a consistent business phone number. Who should purchase the Plus plan? Talkroute’s Plus plan takes the solid calling features of the Basic plan, and adds support for a team to be added in and phone menu systems for incoming calls. It is best for small but growing teams that need a more professional presence, but want to use everyone’s personal devices to make it all happen. Who should purchase the Pro plan? If you’ve expanded past a team of 10, and need to start tracking your calls, Pro could be a good fit for your team. Who should purchase the Enterprise plan? If your team is quite large, and requires some special support considerations, then Enterprise is what you’ll want to consider. Establishing a Service Level Agreement will give expectations for the maximum amount of time your team will wait for a support response. This is also great for very complex businesses with existing systems that Talkroute will need to integrate with. Talkroute’s unlimited minutes and great set of features in the first tier of pricing puts it ahead of the other pricing plans for other call forwarding services like Grasshopper and eVoice. The one thing that is lacking is the tiered access to support, which starts at the level of emailing with the lowest plan, adding chat, phone, and prioritized support at higher tiers. Talkroute’s customer service is highly rated, which may be partially due to the prioritization of support at higher tiers allowing their support teams to more effectively work with customers at each level. Talkroute’s help center is also very well structured and clearly laid out to help with questions a user of their system might have. Talkroute was also the only company we saw that provided the option of a Service Level Agreement (SLA) as part of a pricing tier. 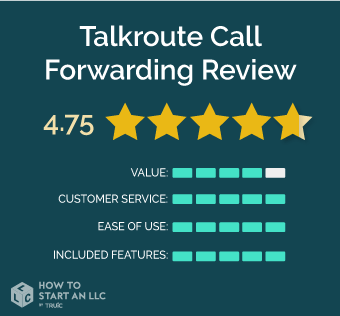 With simple and clear setup, and ease of access to the support team, and the help center resources supplied by them, Talkroute is one of the easiest to setup and use call forwarding systems that we’ve reviewed. Talkroute includes a lot of strong features with their Basic plan, including an auto-attendant feature that many phone services do not introduce unless a more expensive plan is chosen. This, along with the expanding features of extensions, a company directory, reporting, and finally SLA support at higher tiers helps for organizations that need just a little extra help.